We are pleased to announce our new system for managing IANDS memberships and subscriptions, powered by Neon! If you are a member or subscriber, your IANDS account is keyed to your email address. The first time you login (the blue Login button), you need to set your login name and password: click on Forgot Password? An email will be sent with a link to set your login name and password. For problems, see Login Problem Solving Tips. Once you are logged in, you can view and update your profile information, view your membership and donation details, renew your membership, and so on. Access this information from the Members dropdown menu on the top navigation bar of every window. In the new system, you can select to renew your membership automatically every year, and can set recurring donations to be paid monthly, quarterly or annually. IANDS has joined with several other organizations to found the Alliance for Global Consciousness (AGC). The Alliance is an affiliation of like-minded organizations whose objective is to elevate their service to humankind and advance the evolution of their work, both individually and collectively, while moving further toward a shared purpose, namely: The transformation of human consciousness across the globe. (Author, Business Consultant, Hypnotherapist) made himself available the weekend of Jan. 14-15, 2017 to answer any questions people had about the Int'l Assoc. for Near-Death Studies (IANDS) and what it's mission is doing for the world. Welcome to IANDS' new web site layout! We have fixed many problems with the existing site, but there may still be problems: if you find a problem, please report it to us. IANDS President Emerita, Diane Corcoran, RN, PhD, Retired Army Colonel was on Coast-to-Coast AM radio program with George Knapp... Sunday, July 19 at 1:00 am. A recent article in The Atlantic by Gideon Lichfield provides a fair and balanced presentation of near-death experiences and features IANDS prominently, from the recent 2014 Conference in Newport Beach. 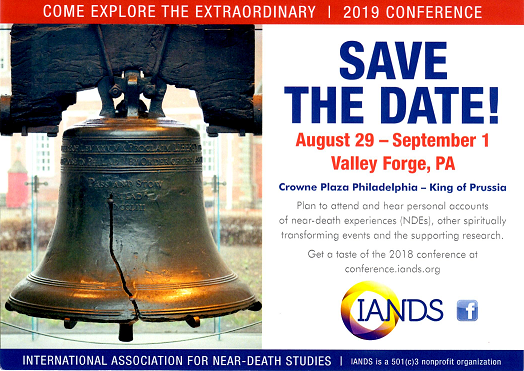 Lichfield interviewed IANDS President Diane Corcoran and several NDE researchers including Alan Hugenot, Mitch Liester, Robert Mays and Kim Clark Sharp. Lichfield explores the physiological as well as transpersonal explanations of NDEs, including the similarity of NDE narratives to the archetypal hero's quest of Joseph Campbell. He brings in the evidence of veridical perceptions in NDEs that have been elusive in NDE studies, including the AWARE study of cardiac arrest patients, as well as the recent EEG study on rats at the end of life. Finally, Lichfield balances the skepticism of Susan Blackmore (from a recent email exchange) with the thought that even materialists "can learn a great deal from NDEs ... about the central role that the [NDE] stories we tell play in shaping our sense of who we are."